When you pull into the campground and check in, just follow the paved interior roads to your spacious and level campsite. All 53 sites at Boone RV Park are "Texas Big" to accommodate double slideouts and pull-thrus. Parking is easy for those of you who have longer rigs. All RV sites feature full hook-ups including 20, 30, and premium 50 amp electric service. WiFi and cable TV are also available so you can stay up to date and catch all your favorite programs. You'll be able to enjoy several luxuries and all the comforts of home with Boone RV Park's unrivaled amenities and facilities. You'll appreciate the spotless 10 star rated restrooms and clean shower house designed for your comfort. The park's laundry facility offers modern washers and dryers, making it easy to keep up with daily chores. 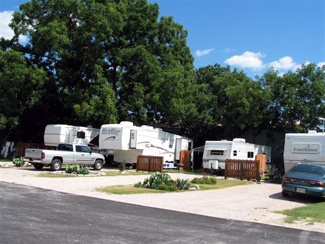 No other RV park's facilities can compare to Boone RV Park's comfortable facilities. Whether you are with your family reunion or a large group, Boone RV Park provides group areas, a recreation hall, and picnic tables and barbecue facilities for your convenience and comfort. You'll find a comfy gathering spot with plenty of seating and a kitchen.